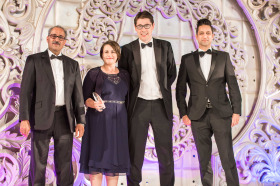 Tong Garden Centre was announced as the Elite Business of the Year at the recent Aagrah Restaurant Group's 36th Annual Dinner and Elite Yorkshire Business Awards that raised £125,000 for charity. Tong's managing director, Mark Farnsworth and commercial director, Sharon McNair were among the 600 business guests attending the event at the Centenary Pavilion, Leeds United. Of the award, Mr Farnsworth said: "Yorkshire boasts some of the largest and most successful companies in the UK and I'm proud to accept this award on behalf of the team at Tong who have worked tirelessly to restore Tong to its former glory." Aagrah's fund raising is done through its charity wing, Jannat Welfare International Trust, in memory of Sajid Sabir, late son of Aagrah's Chairman, Mohammed Sabir, MBE, Hons Dbs to benefit local, national and international charities. This year's main beneficiary charity is The Yorkshire Cricket Foundation, Leeds. In the last 12 months, Tong Garden Centre has won five awards at the North East and North West regional Garden Centre Association (GCA) awards, three Horticulture Week awards, two awards at the Garden Centre Retail awards, including Destination Garden Centre Outlet of the Year and Customer Service Excellence and Job Creator of the Year in the Bradford means Business Awards.